I meant to get back to the honeymoon story by sharing some wedding pictures today. Alas, while we do have power again after the big storm on Friday, I am behind. It doesn’t help that in two days I’m leaving for Toronto with my dad to visit our family. Nor does it help that I’ll be leaving my husband behind. The Passport People apparently are suspicious of a man changing his name in marriage and wouldn’t issue him a passport. He may have been able to scramble it together in time, if it weren’t that he’s been mostly in the woods working for Outward Bound. He’ll get it eventually but it will be another whole year before he meets my dad’s side of the family. So while I’m pre-occupied with laundry and work projects, spending a few precious days with Will, and doing more cooking, you get another food post. I wrote this a couple of weeks ago and saved it just for times like these. Not much of a recipe here so much as a good mashing of stuff together. When I’m more inspired I make my own mayo and my own pesto. This time I opted for easy. Going with prepared mayo and pesto also meant that I could make it any time in the week. There was no wilting basil pressing on my time. As always a team huddle of ingredients to sort out the game plan. Turned out that the pistachios and garlic wasn’t needed. 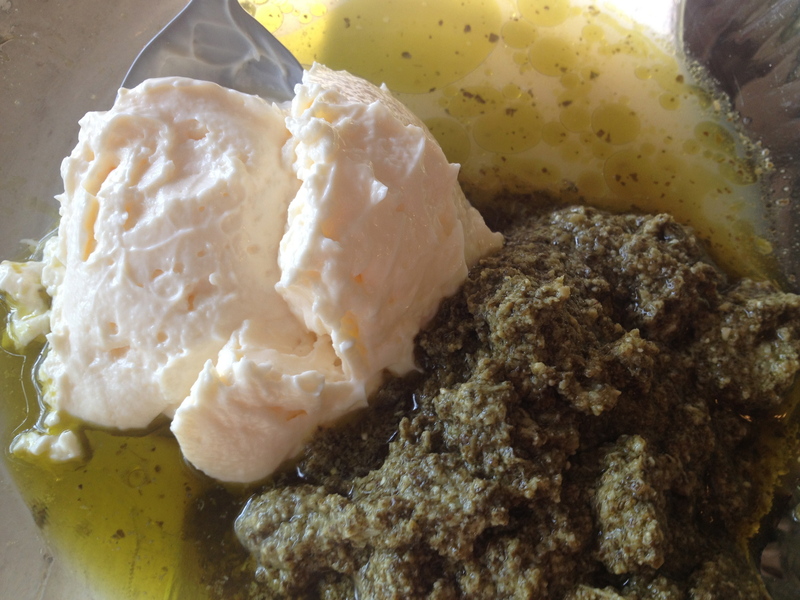 I wasn’t sure how flavorful the Alessi pesto would be, it was pretty powerful. 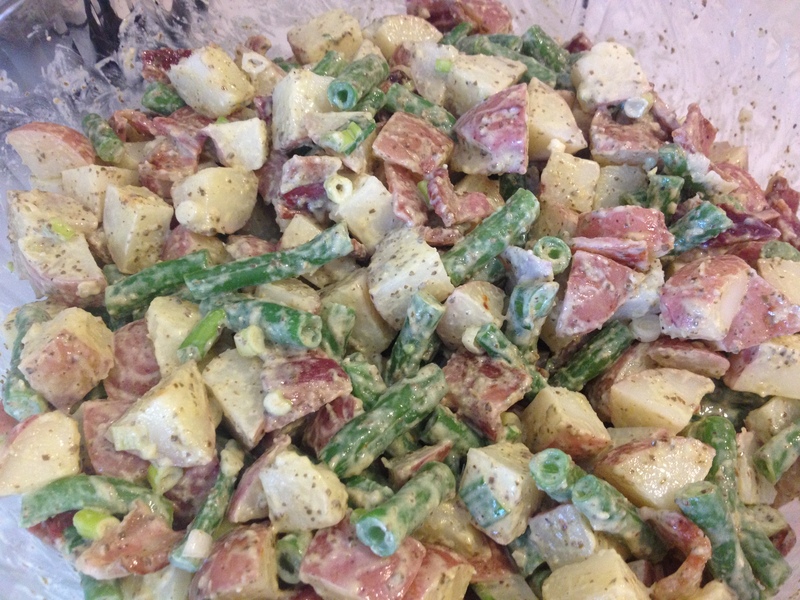 I used an entire bag of “b” sized red potatoes, and about 1 pound of green beans. I washed the potato, diced it and added it to heavily salted water. I cook my potatoes the way I’d cook pasta, in water that tastes salty like broth. 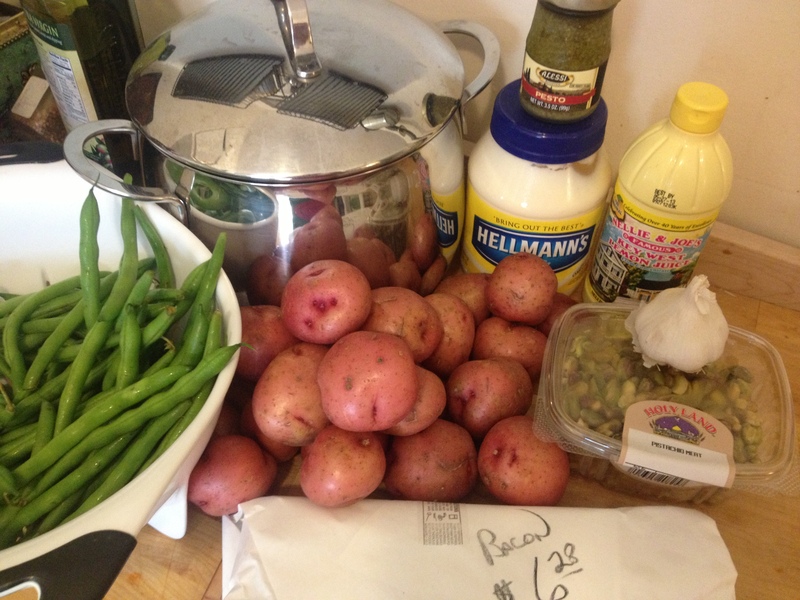 I then started the bacon and prepped the beans. When the potatoes were almost done I added the beans to the boiling potatoes. Once the water returned to a boil (probably about a minute) I drained them. Meanwhile I mixed up a generous dollop of mayonnaise (you could probably get away with less), the entire jar of pesto, and a liberal glug of lemon juice. Once I tasted it I decided it didn’t need extra garlic or more nuts. I did opt for adding a bunch of green onion. 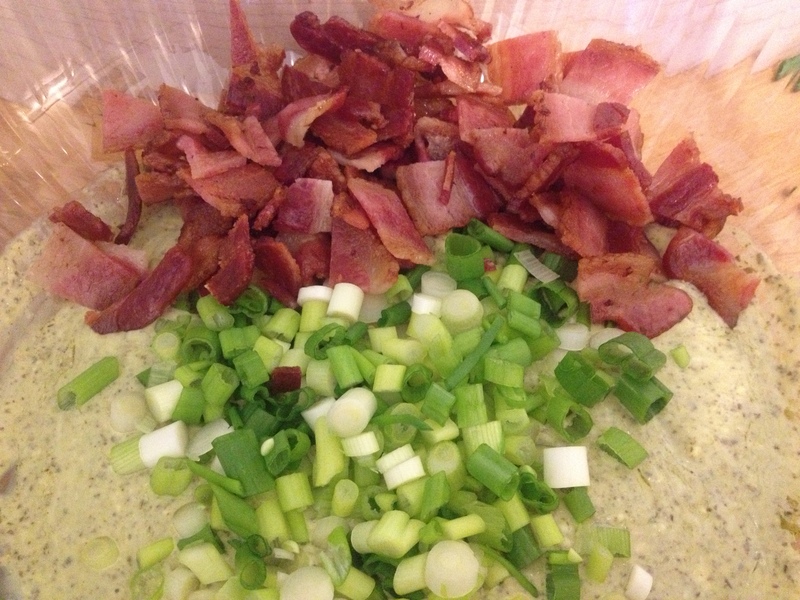 I mixed in about a pound of cooked and chopped bacon, and the green onion into the pesto sauce. 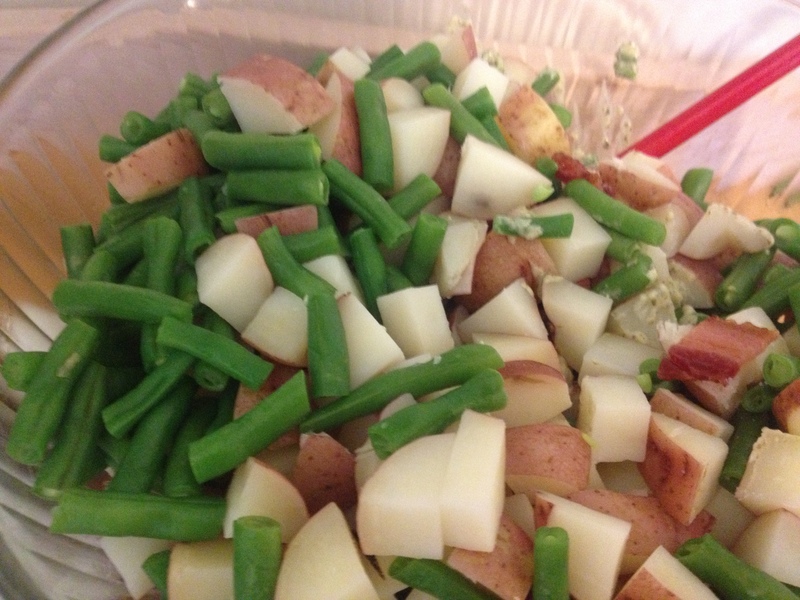 Threw in the potato and green beans. Enjoyed it with some white wine on the porch and will take it to work tomorrow. Thanks for sticking around! I’d love to hear what you throw together on the hot days of summer. 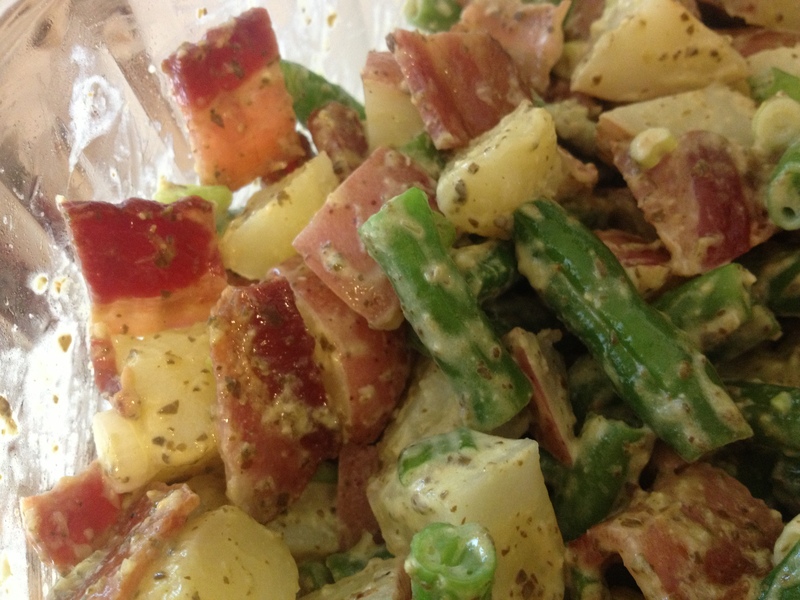 This entry was posted in Kym Cooked and tagged bacon, food, potatoes. Bookmark the permalink.